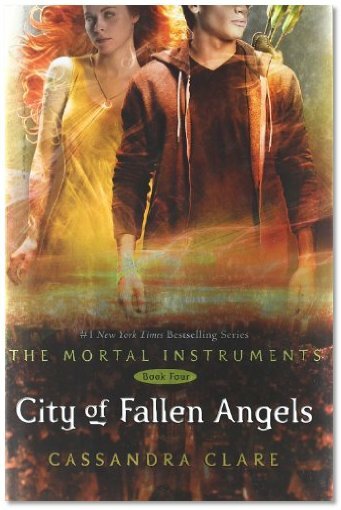 The dish today is based on City of Fallen Angels by Cassandra Clare. But since that’s too far into the Mortal Instruments series to avoid spoilers, I’ll be reviewing the first book, City of Bones, today. Clary Fray is a teenager living in New York with her single mother. She and her quirky best friend Simon spend their free time drinking coffee and listening to lame poetry readings. Things soon begin to change though when Clary witnesses several teenagers with odd markings on their skin “murder” another boy at a night club. The weirdest part of it was that when they stabbed him, he disappeared. Shaken, she tries to forget what she saw. But soon one of the boys from the club, Jace, seems to be turning up everywhere she is. Despite his terribly sarcastic attitude, Jace decides to take a chance and reveal to Clary that he and his friends are Shadowhunters. Shadowhunters are an ancient race made by the combining of angels and humans. Their goal in life to fight demons and protect the unaware human society, which is exactly what they did in that night club. There are also the neutral Downworlders, which are a hybrid of demon and human (this includes werewolves, vampires, faeries, and warlocks). After learning all these overwhelming things, Clary is just desperate to get home. But she finds that her apartment has been ransacked and her mother is missing. Who would want to take her mother? Why does she suddenly have the Sight to see the Shadowhunters? And why does the name Magnus Bane keep rattling around in her head? Clary must answer all of these things if there’s any hope of seeing her mother alive. 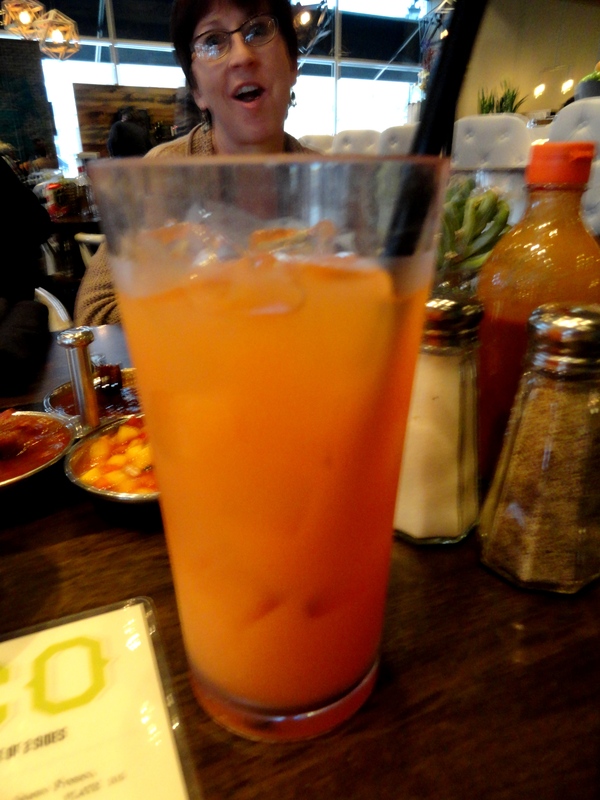 “That’s a mango.” Simon stared at Jace. Sometimes it really is like Shadowhunters were from an alien planet. Jace pondered for a moment. “Tomato soup,” he said finally. 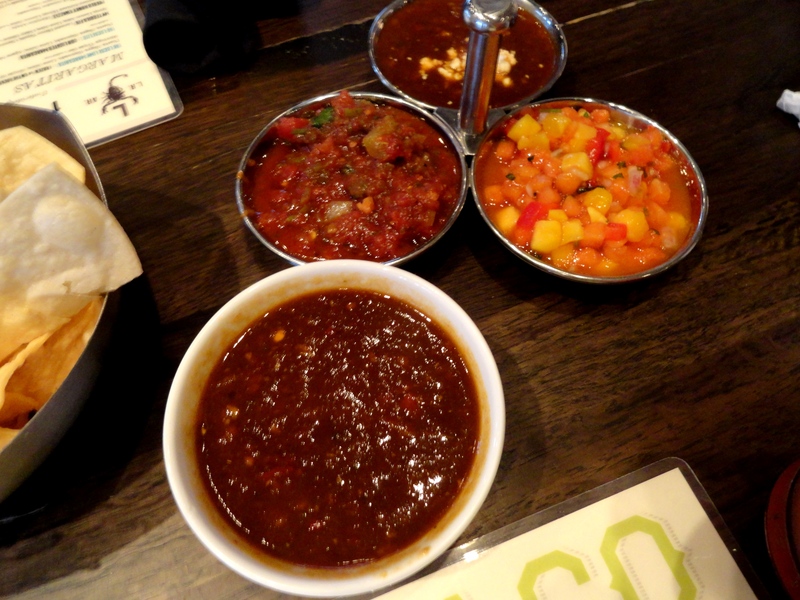 It is so hard to find a recipe involving tomatoes and mangoes that isn’t for mango salsa. 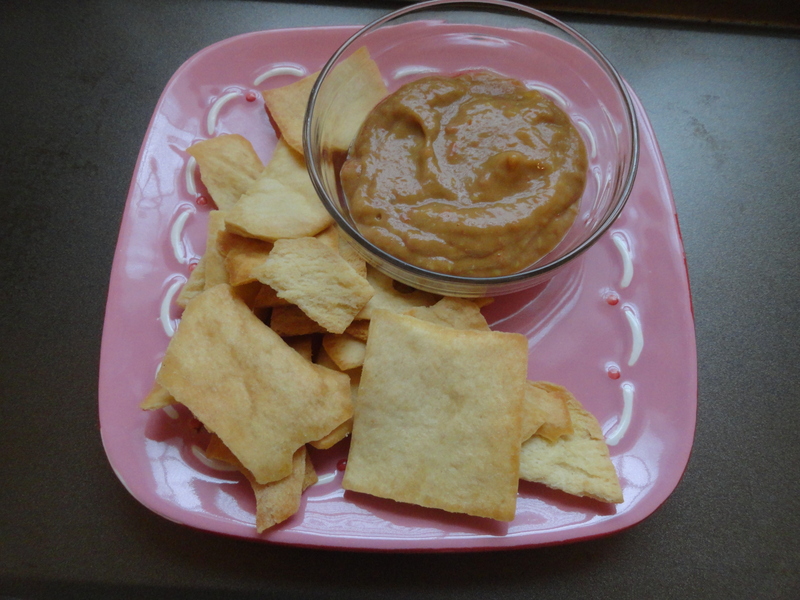 After much searching and by taking some creative liberties I came up with (drum roll please)… The ugliest chip dip ever! Seriously, it doesn’t look good, but it tasted great. I used this recipe for tomato-mango soup and added some salt, pepper, and a deseeded jalapeno. It was too thick for me to enjoy as a soup, but it was just right to dip pita chips into. I’m pretty sure even Jace would care about this food. The best thing about summer is the abundant fresh vegetables that are in season. During this time, most of my meals are vegetable based. I wish I could find things like tasty tomatoes and flavorful corn all year, but alas, I will just enjoy them while they’re available. 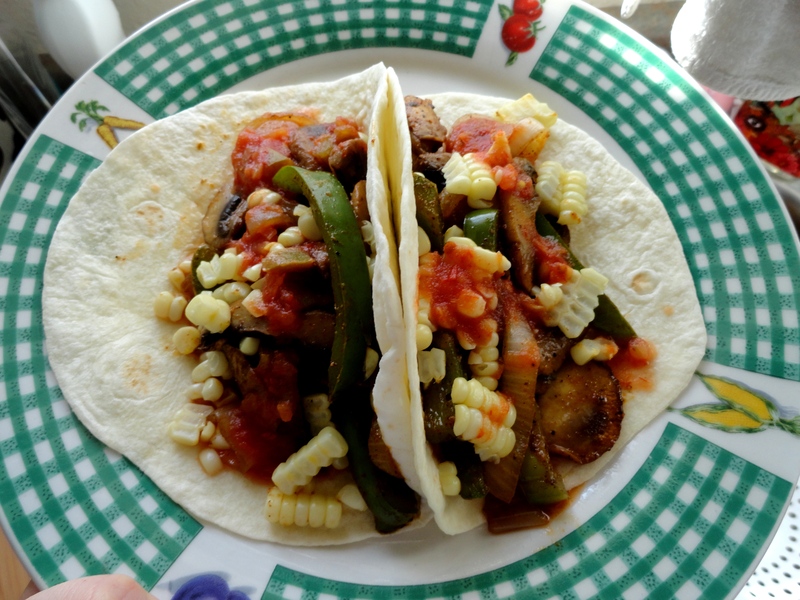 Veggie soft tacos with mushrooms, onions, bell peppers, corn, and salsa. 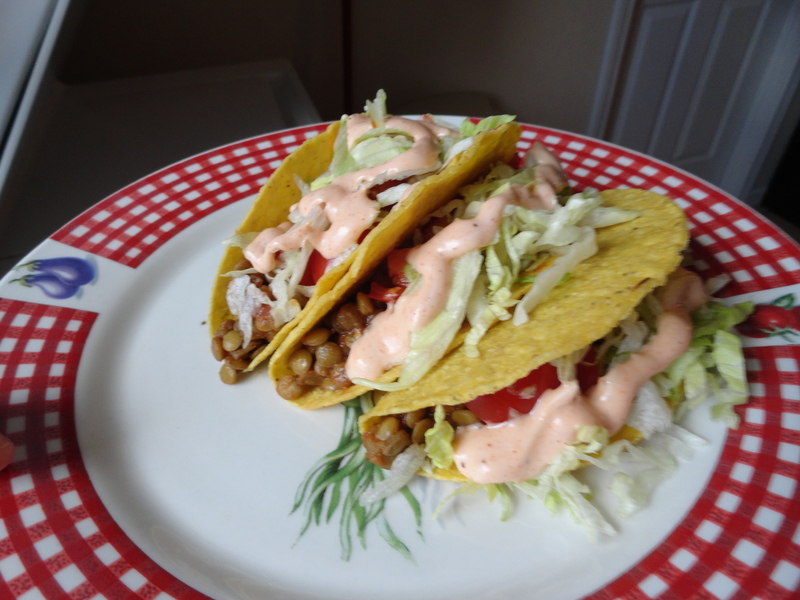 Tasty lentil tacos with lettuce, tomato, and sriracha vegenaise. I’ve never had lentil tacos before, and was pleasantly surprise how meat-like the texture is. Lentils are also healthier and more economical than vegan beef crumbles, so lentils will be my regular taco-filler from now on. 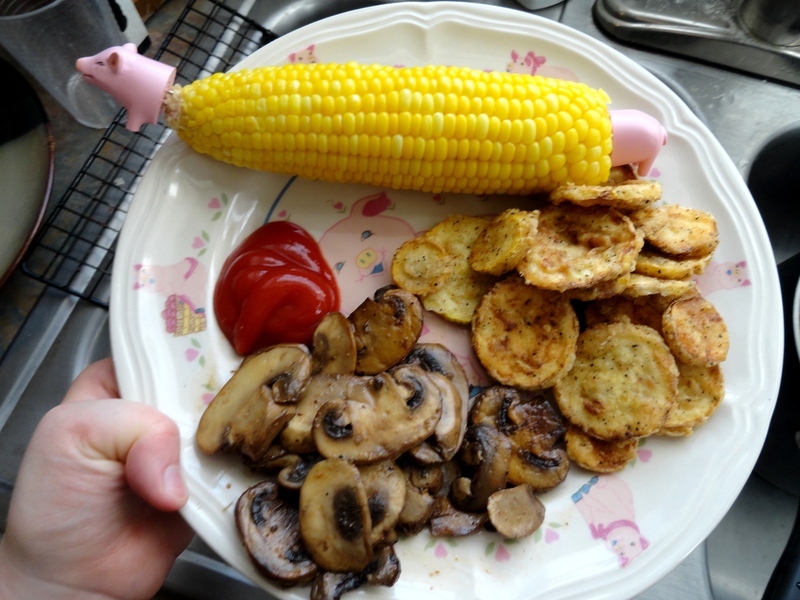 Sauteed mushrooms seasoned with Slap Ya Mama, ketchup for mushroom dipping, steamed corn, and fried squash. 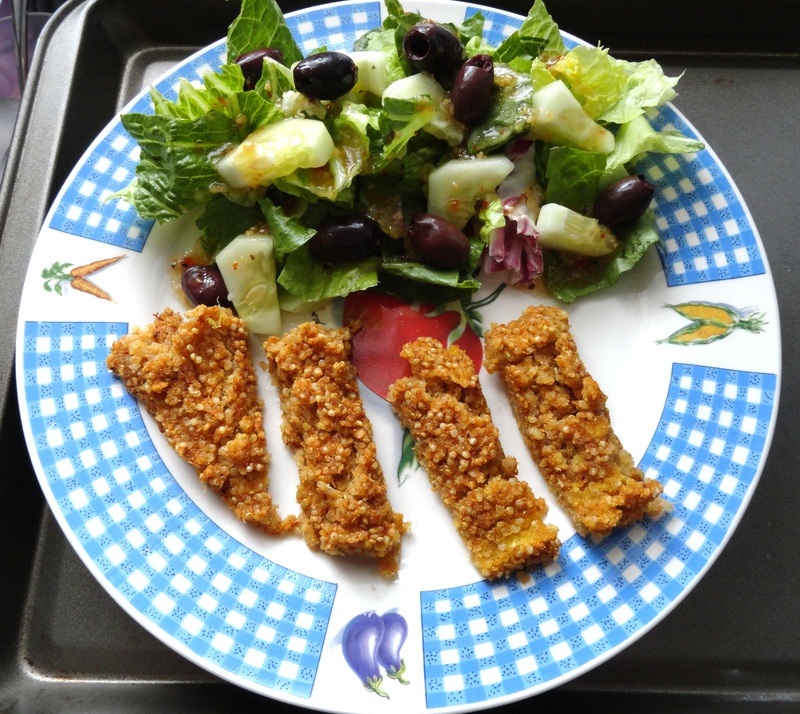 Quinoa-polenta sticks, and a salad with cucumbers, olives, and Italian dressing. 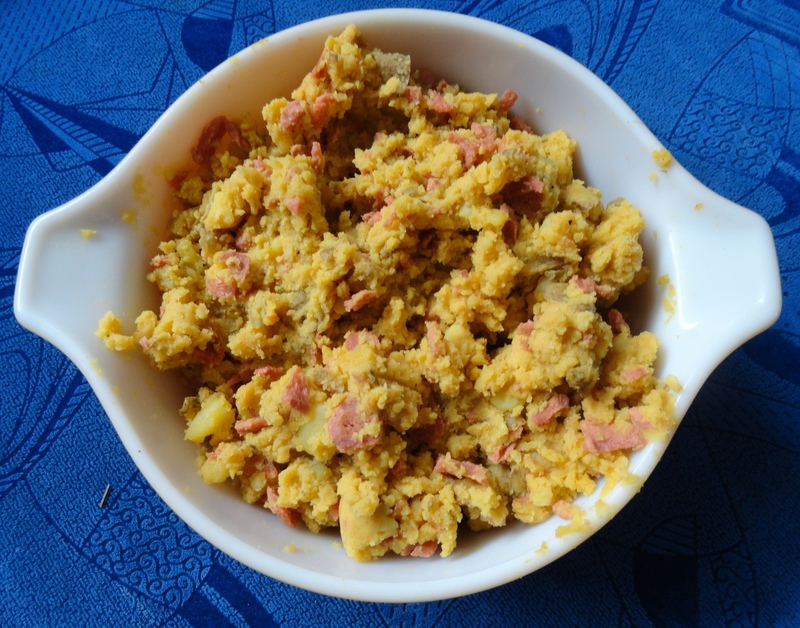 I enjoyed the quinoa-polenta because it is one of the few recipes I’ve liked that involves quinoa, which sadly is a food I am not super fond of. Plus, once baked, it was easily sliced into sticks which are perfect for dipping into ketchup or BBQ sauce. 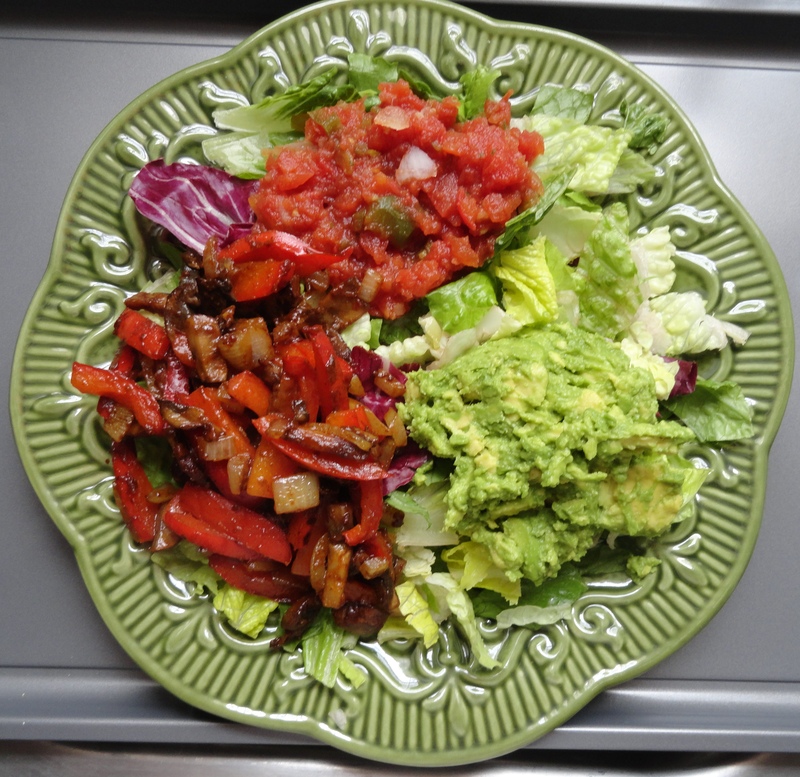 Fajita salad which is sauteed mushrooms, red bell pepper, and onions, fresh salsa, and mashed avocado all on top of a bed of lettuce. 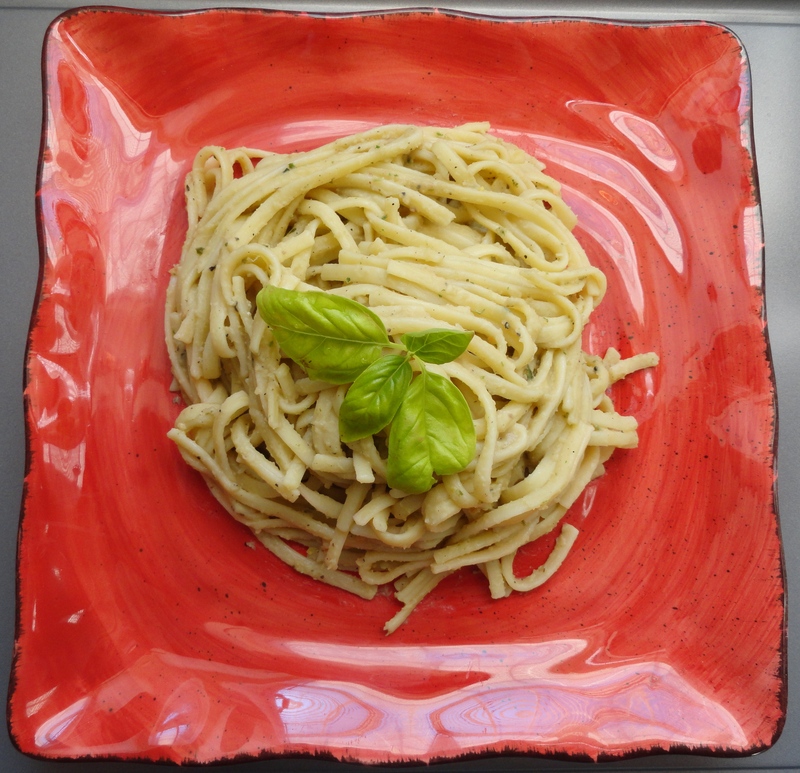 Linguine with basil and white bean sauce from Vegan Planet. It’s supposed to be sage and white bean sauce, but all we had on hand was basil. It turned out delicious and my roommate Ryan was surprised how such a creamy sauce could be made without dairy and with beans instead. I hope everyone had a good Easter! My Easter was full of friends and good food, so I would count it a success. The University of Montevallo’s Family and Consumer Sciences Student Group had an Easter-themed bake sale on Wednesday. 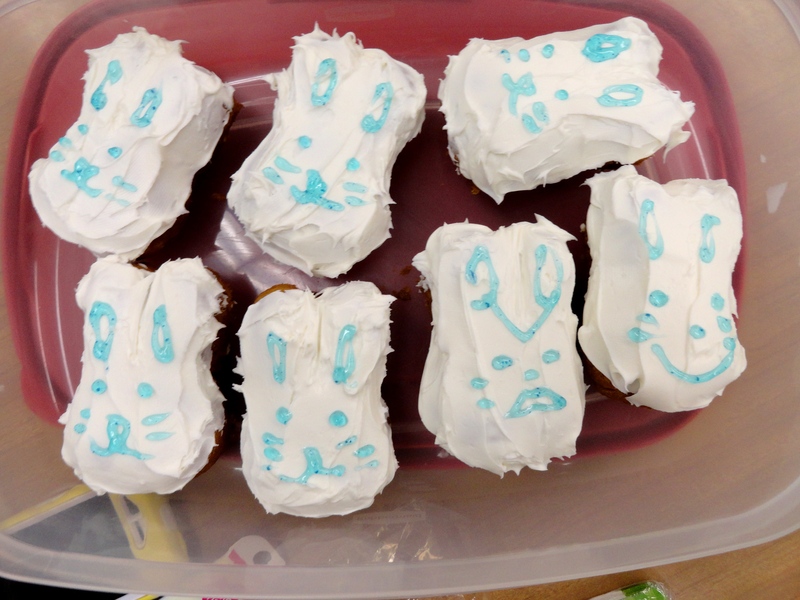 For that I made pumpkin spice cake bunnies with cream cheez frosting. 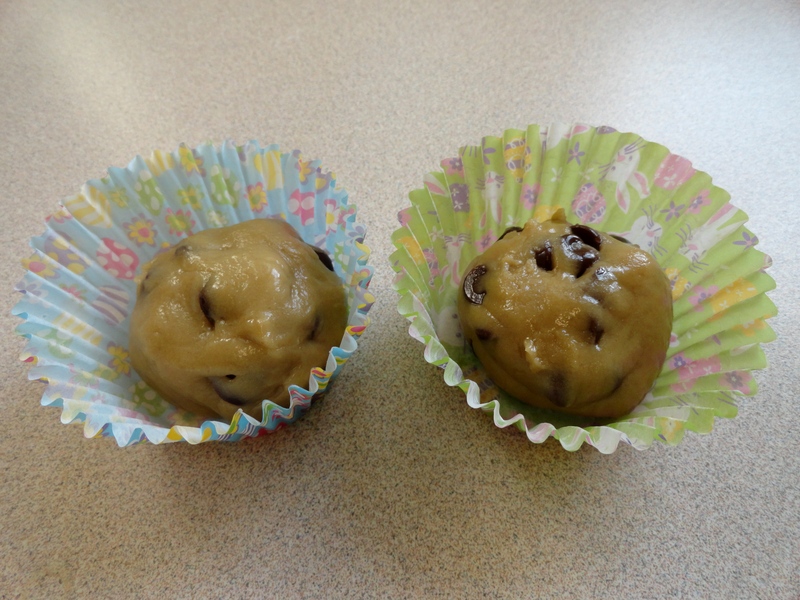 I also made cookie dough bites from Vegan Cookies Invade Your Cookie Jar. These were a great hit and multiple people kept asking “There aren’t any eggs in these? !” Um, no. I’d prefer vegan cookies over a case of salmonella any day. For actual Easter day I had a lovely lunch with Peter and our friends Charlie and Sierra. Then afterwards we spent time playing board games and making Easter things. 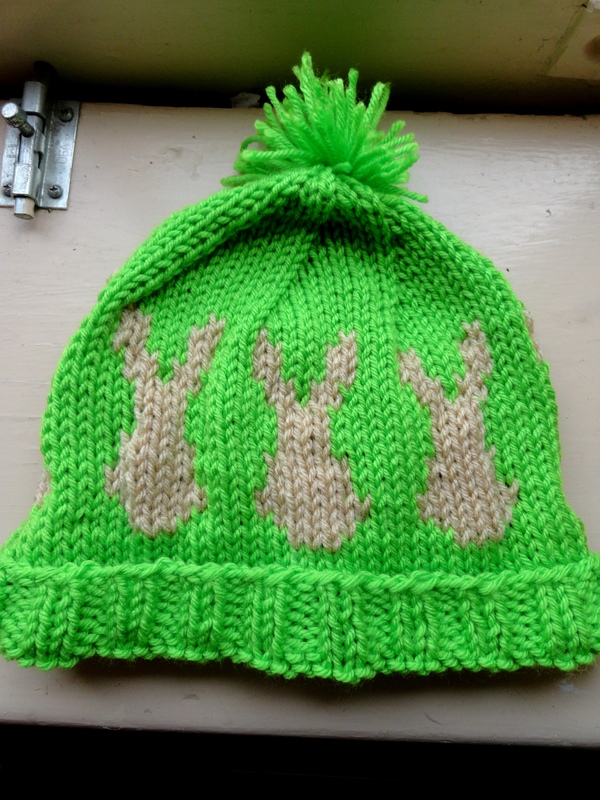 For a festive look, I knitted this adorable bunny hat. I used Slip Slip Knit’s knitting chart for the bunnies. 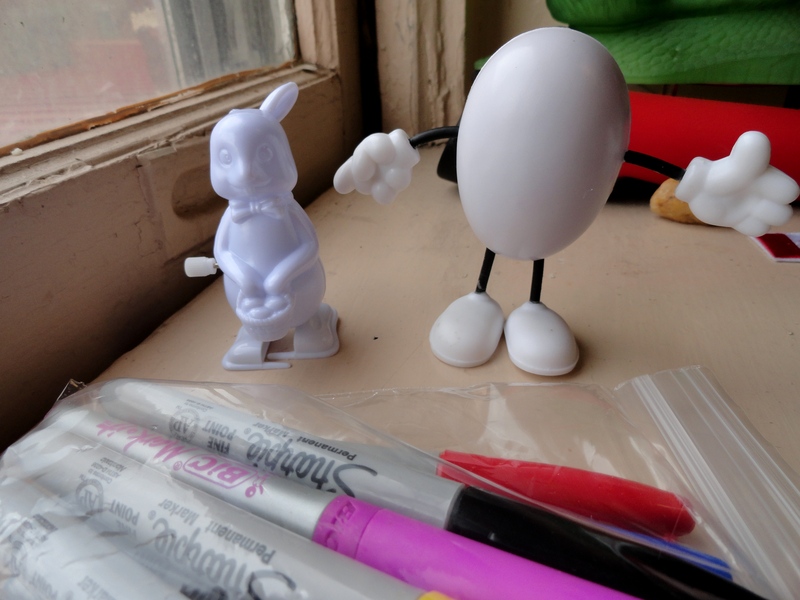 Instead of the traditional egg-dyeing, I went an animal friendly route and got some blank plastic toys from Hobby Lobby and decorated them with markers. For lunch we had a mish-mash of snacks. 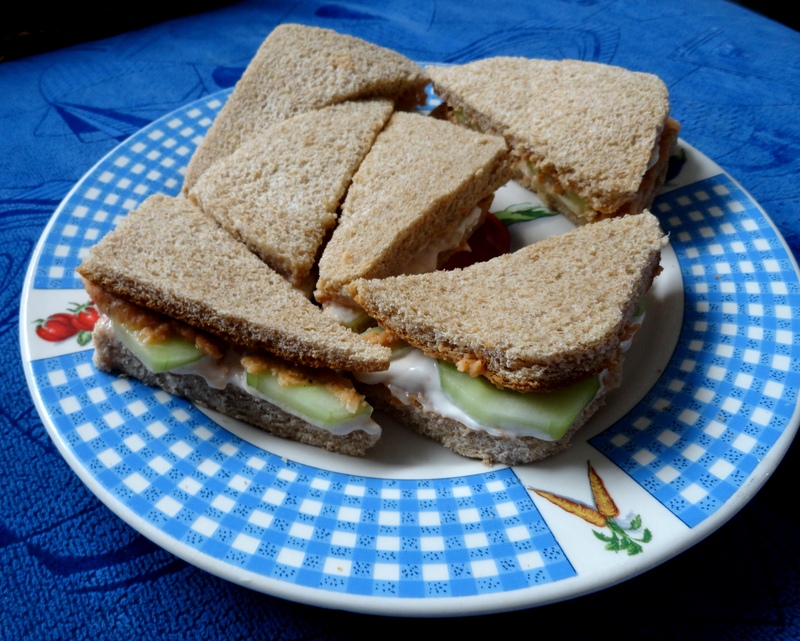 I made some tea sandwiches with whole wheat bread, sliced cucumber, spicy sriracha bean dip, and Vegenaise. I used my go-to potato skins recipe, but got lazy and boiled the potatoes with the skins on and mashed them with the other ingredients (minus the onions and Tofutti cheese). They had all the taste of potato skins, but without the added effort of scooping out the filling. 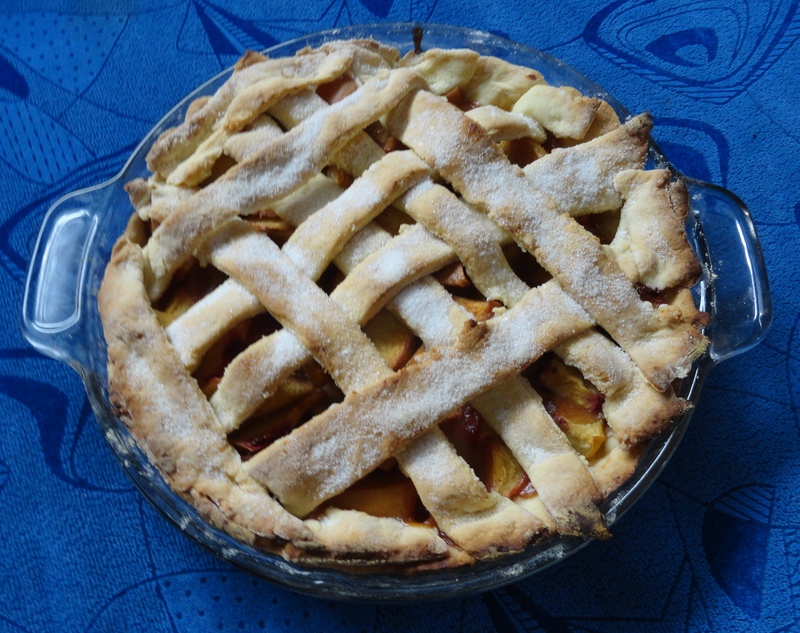 And for dessert Sierra made this delicious spicy peach pie. Can you believe this is the first pie she’s ever made? I never would’ve guessed. Okay, so I know my blogging has been inconsistent, but I am determined to change that. I’ve had a super busy semester at school, plus lots of other responsibilities to worry about. But I have decided that I need to make time for blogging because it’s something I really enjoy doing. 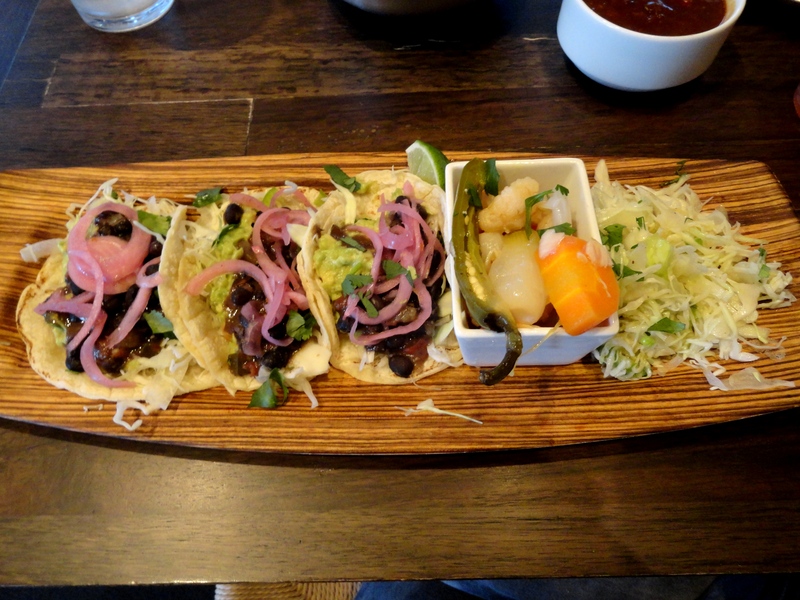 This post is to catch up and share all the pictures of food I’ve taken up to this point. 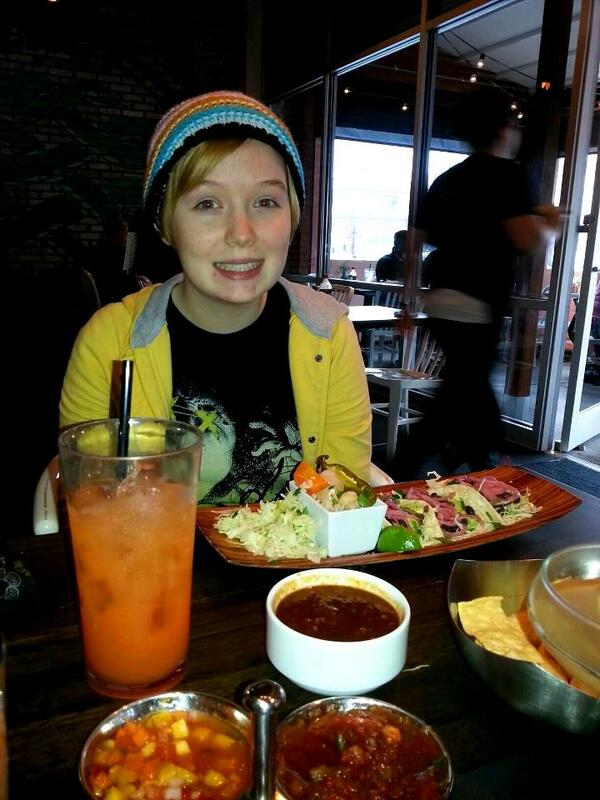 It’s not a ton because I haven’t been eating a lot that’s “blog worthy”, but I’ll hopefully have more to post soon. The falafel plate from the Purple Onion. It’s vegan as long as you ask for no cheese on the salad. 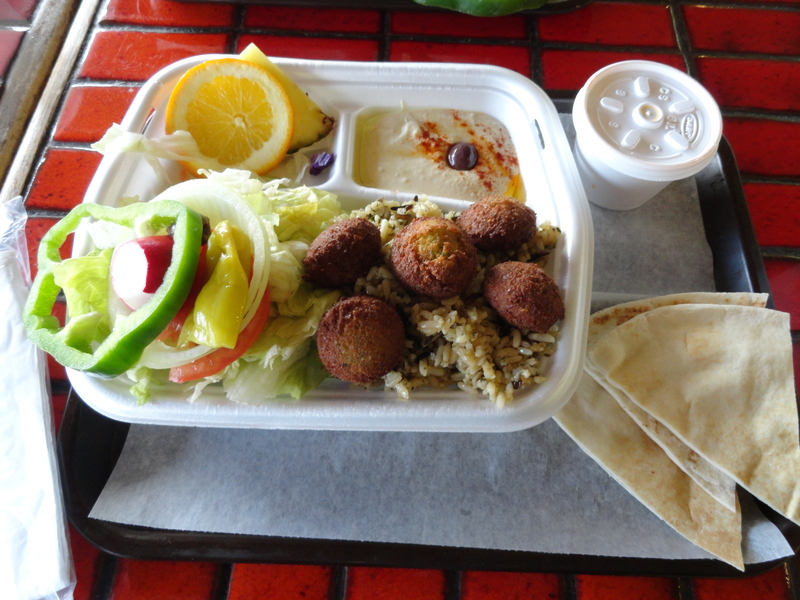 It comes with a side salad, falafel, wild rice, pita bread, hummus, and fruit. Really good food, for a fairly reasonable price ($9). Here is some tomato veggie couscous I made for a potluck. 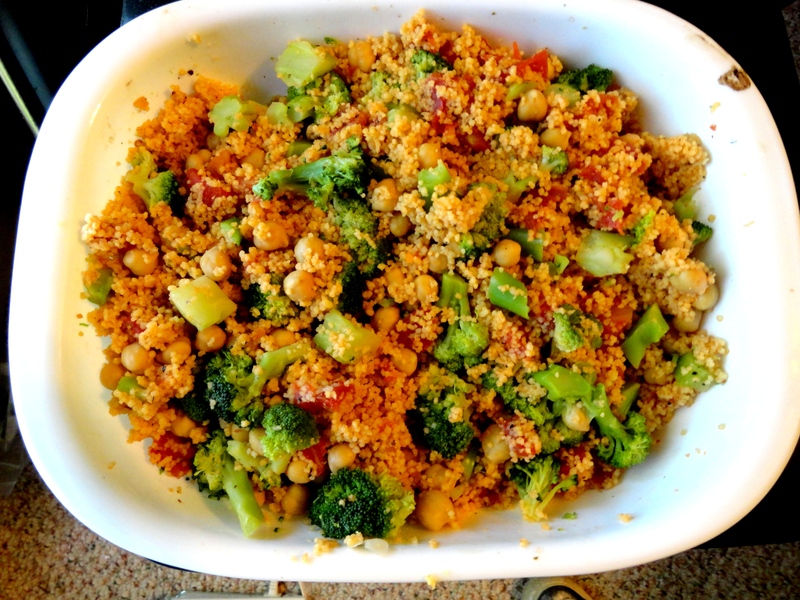 It’s couscous cooked in canned tomatoes and seasonings, with garbanzo beans and broccoli mixed in to make it more filling. It’s a good thing this makes a whole meal (protein, carbs, and veggies) because, like I expected, there was nothing else vegan available at the potluck. I’ve been trying to slowly, but surely, work through my Pinterest food/recipes board. 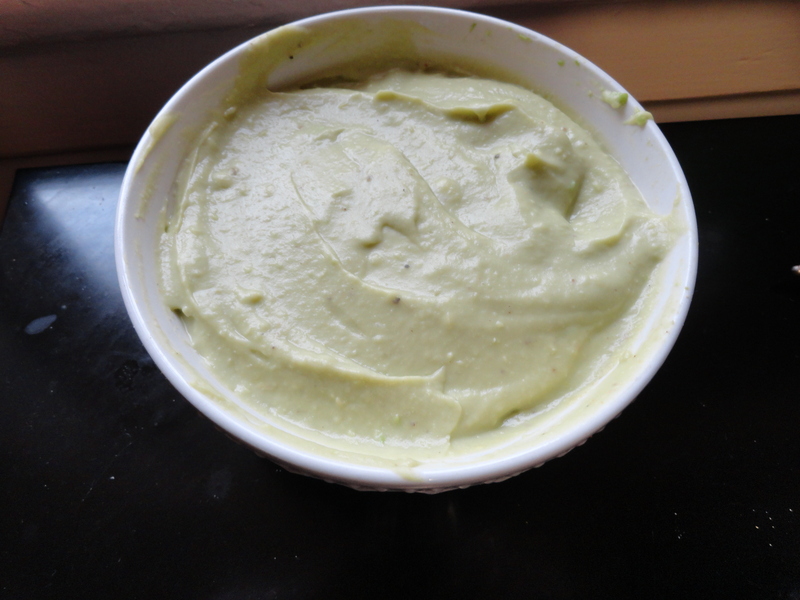 On there, was a lovely recipe for avocado hummus. I was excited to try it, and when I went grocery shopping I got all the ingredients, except garbanzo beans. Apparently the local grocery store doesn’t carry garbanzo beans, canned or dry. So I had to make do with cannellini beans. 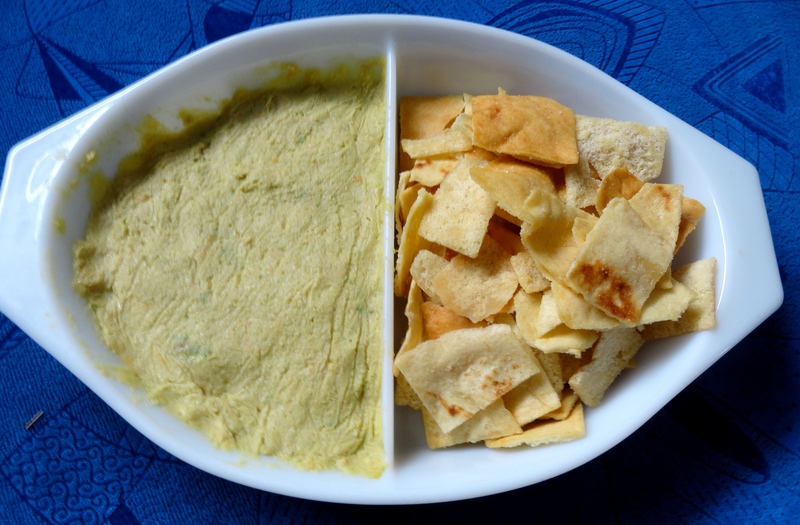 The dip was really great tasting, but with a much creamier texture than traditional hummus. It was almost sour cream-like because of the smoothness. I can’t wait to try it out again with the garbanzo beans. Only recently have I discovered the joys of spaghetti squash. I’d heard about it before, but never gave it a try. Peter and I went out to lunch with some friends to Ruby Tuesday and the only vegan menu item was the spaghetti squash with zucchini (without the parmesan cheese). I tried it and loved it! Since then I’ve tried it several different ways and they’ve all been tasty. 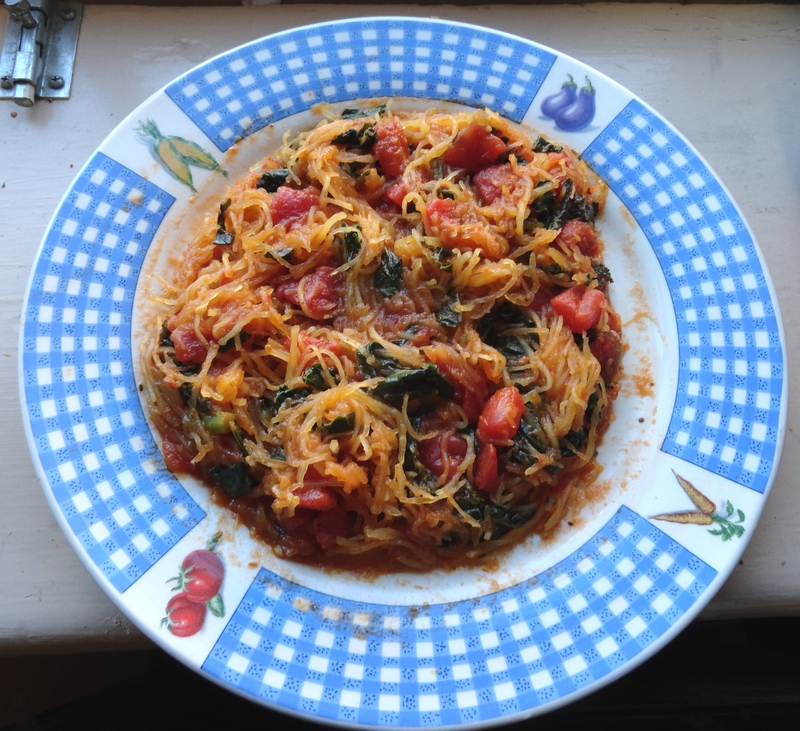 Below is some spaghetti squash with sauteed kale, tomatoes, and marinara sauce. 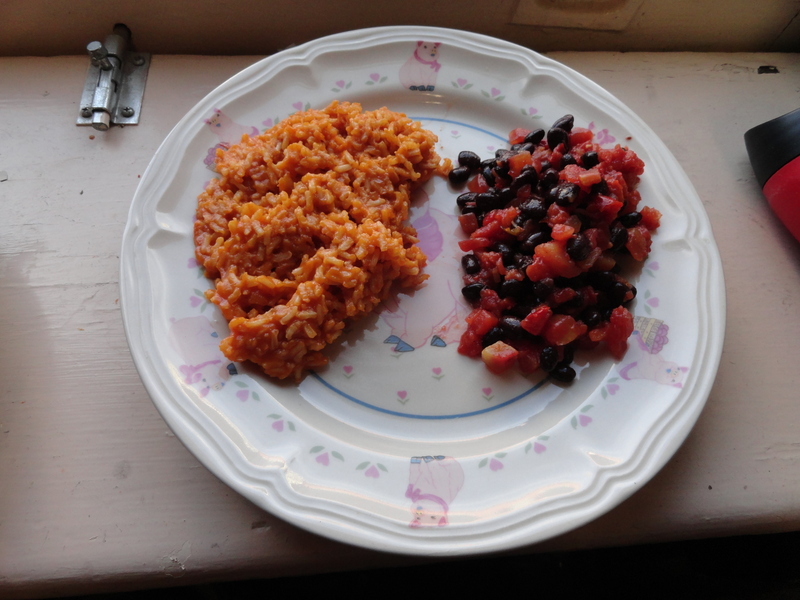 Spanish brown rice and black beans mixed with canned tomatoes and chipotle chili. Super simple, but super yummy. While visiting home for the weekend, my sister took me out to eat at a great Asian restaurant in Hunstville called Panda. 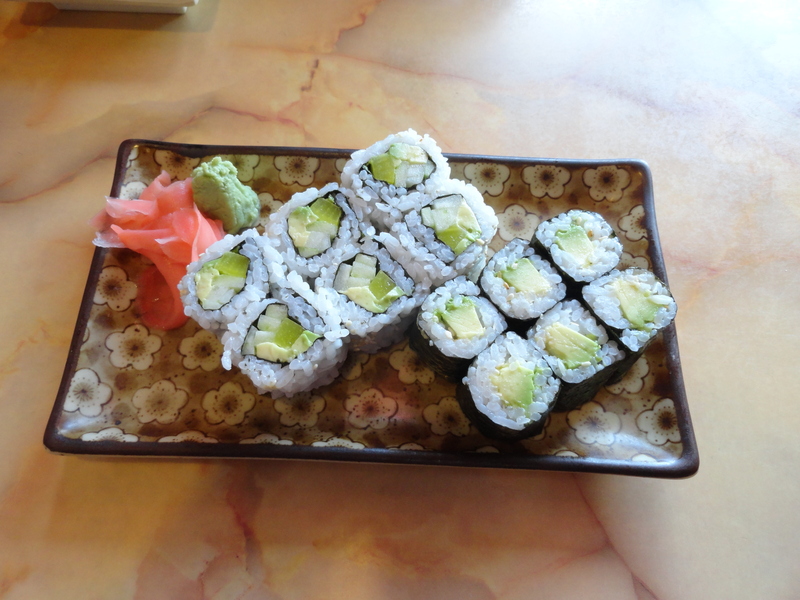 The server knew which tofu was vegan or not (a definite plus) and so we got the veggie and avocado sushi for appetizers, and then the house bean curd which is served with rice, snap peas, broccoli, and water chestnuts. 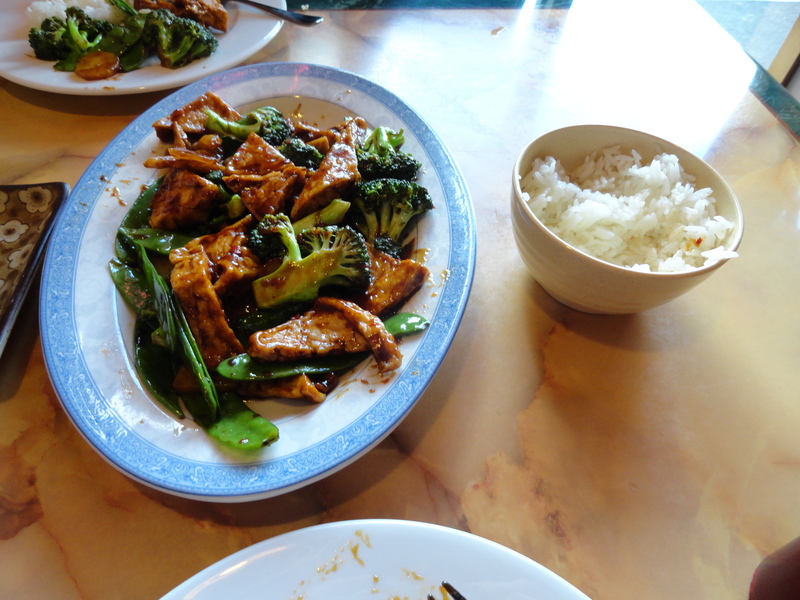 The food was great and the portions were huge, so both of us got an extra meal from the leftovers. Well summer has come and gone, thank goodness! As much as I like having nothing to do, I have desperately missed school and Montevallo. And for some reason when I have nothing to do, I don’t blog either. It may seem strange, but when I’m back at school (even with homework and projects to do) I have much more drive to blog just for the fun of it. 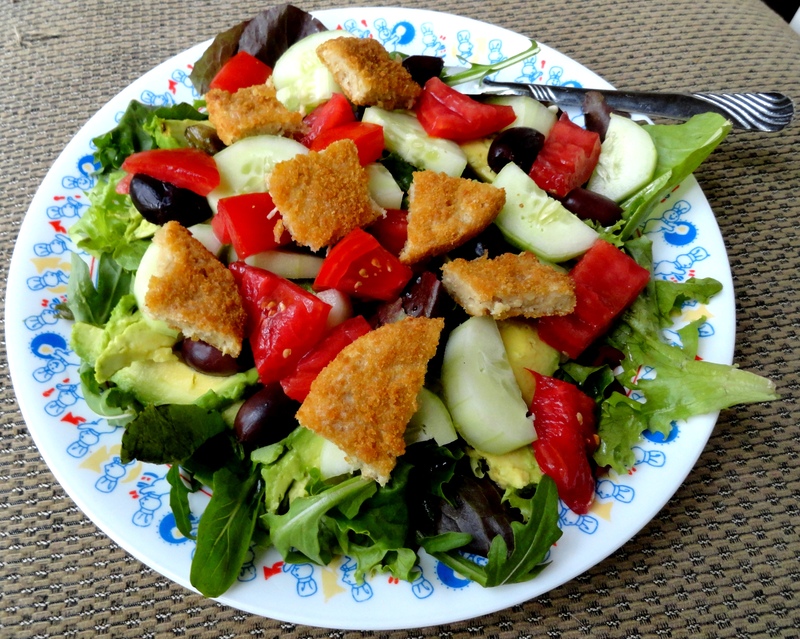 Super veggie salad with mixed lettuce, avocado, tomato, cucumber, kalamata olives, a chopped Boca chick’n patty, and drizzled with balsamic vinegar and olive oil. 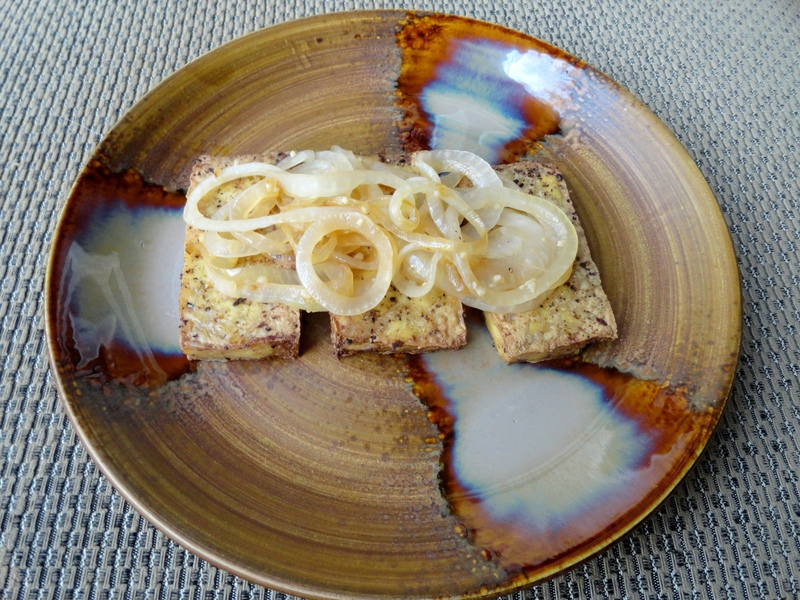 Baked tofu that had been dipped in a simple coating of flour/soymilk with tons of seasonings and topped with caramelized onions. I realize this salad (can it really be called a salad if there’s no lettuce?) isn’t the prettiest dish around, but it sure was tasty. 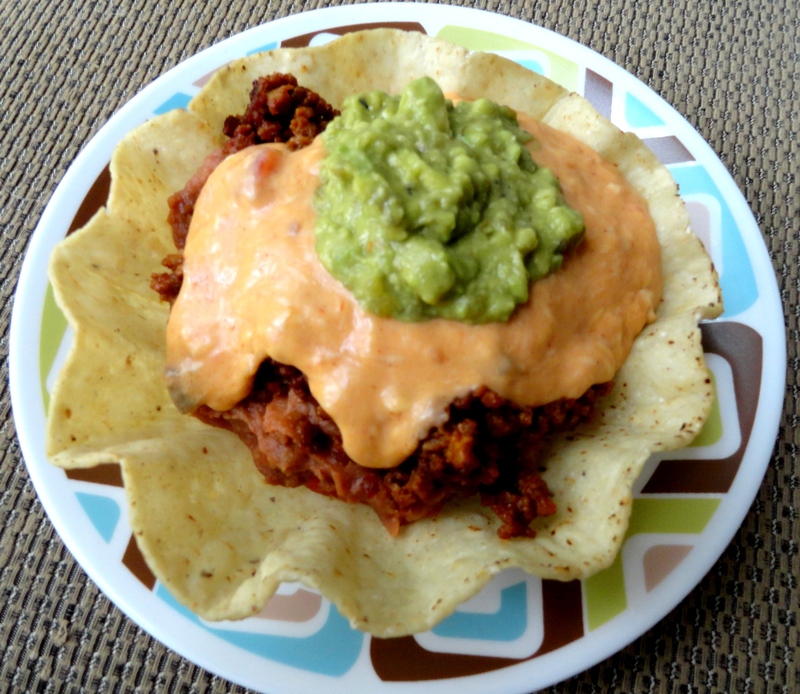 A tortilla bowl with beans, spiced veggie crumbles, nacho cheez (made with Daiya) and guacamole. 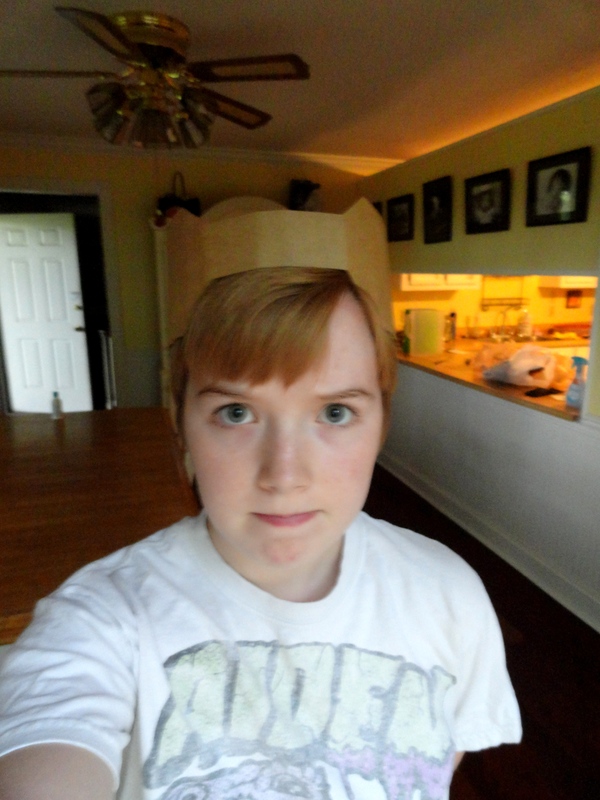 I also found out that the cardboard braces in the tortilla shell box make fantastic crowns! That is me modeling it below with my serious face on. Summer is the perfect time for an ice-box pie. 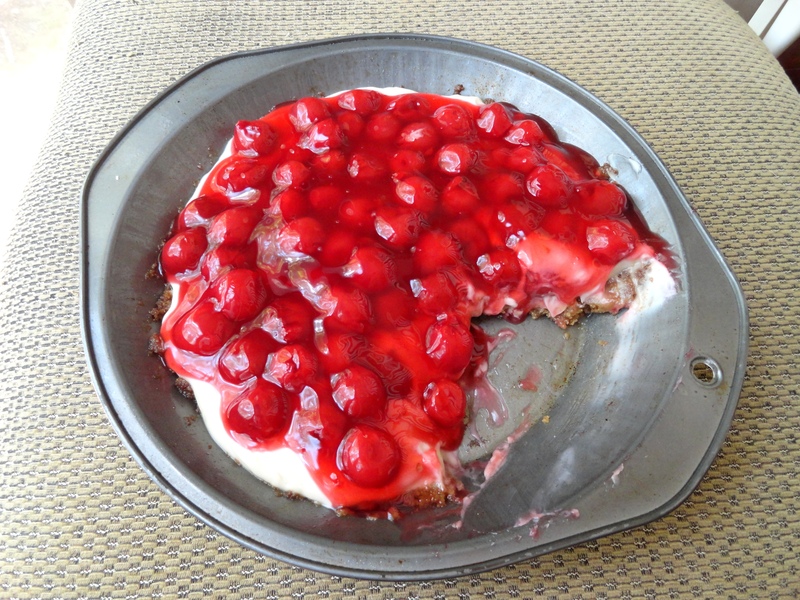 So I made this cherry cheez-cake pie. It’s just a simple homemade graham cracker crust layered with a mix of cream cheez, vanilla extract, and powdered sugar, then canned cherry pie filling. Super simple and fast, but really good. Here’s yet another salad. 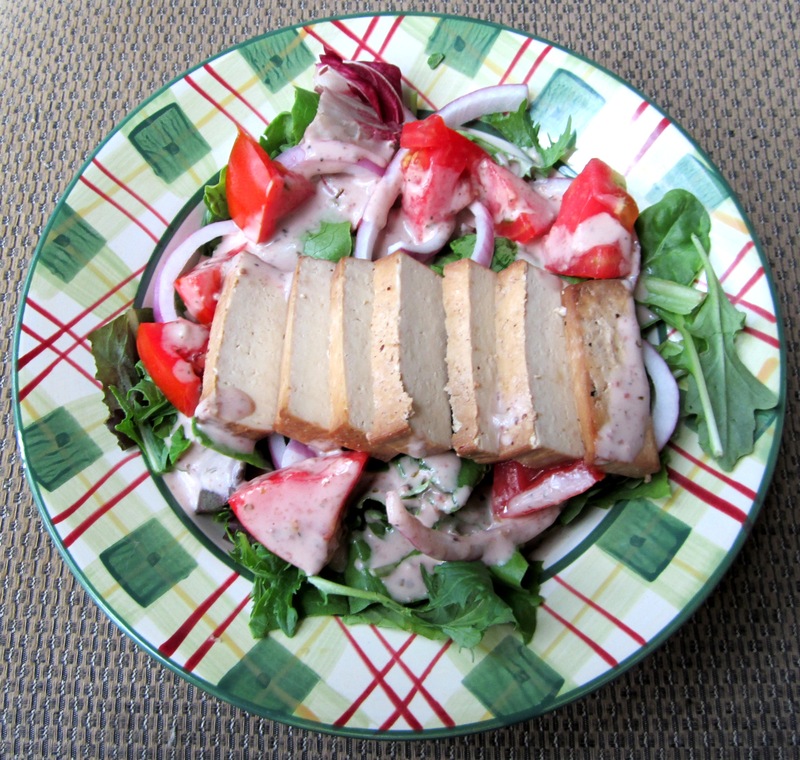 This one has mixed lettuce, red onions, tomato, smoked tofu, and kalamata olive Greek dressing. I (sadly) can’t remember the name of the dressing brand, but I bought it at Earth Fare. It is by far the best salad dressing I’ve ever had, so if I can find the name I’ll be sure to share it here. 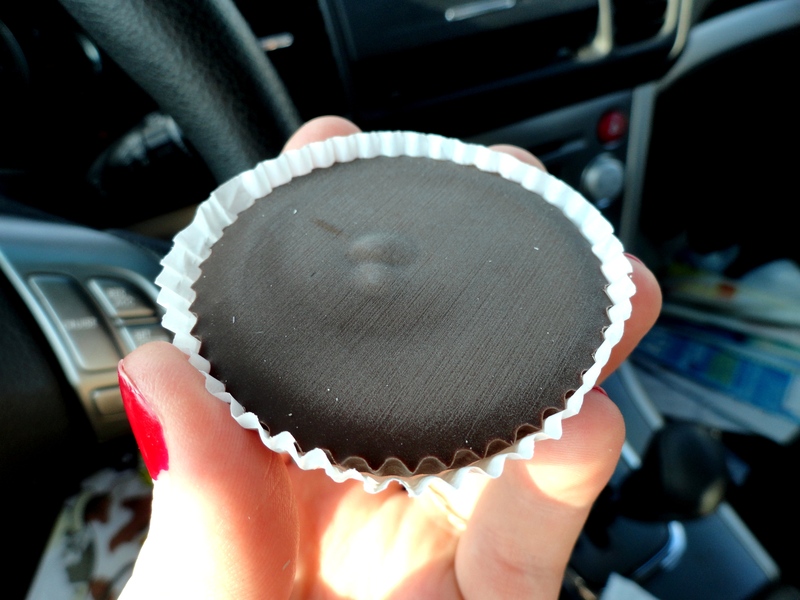 And this summer I also experienced something wondrous: I ate my first peanut butter cup since going vegan four and a half years ago. My traveled to Cullman, AL to visit my friend Seth and while we were there we found Justin’s organic peanut butter cups. They are less sweet than the traditional Reese’s Cups that I remember, but the dark chocolate and natural peanut butter were phenomenal together. Definitely worth the long wait to find something this good. Spring is in the air!… Well, no, not really. But registering for spring 2012 classes makes me feel like it’s right around the corner. Only about a week until we all go home for Thanksgiving break and then less than a month is left of this semester. My eating habits have gotten better over the months though and I’m making more well-rounded meals instead of quick-fix foods. 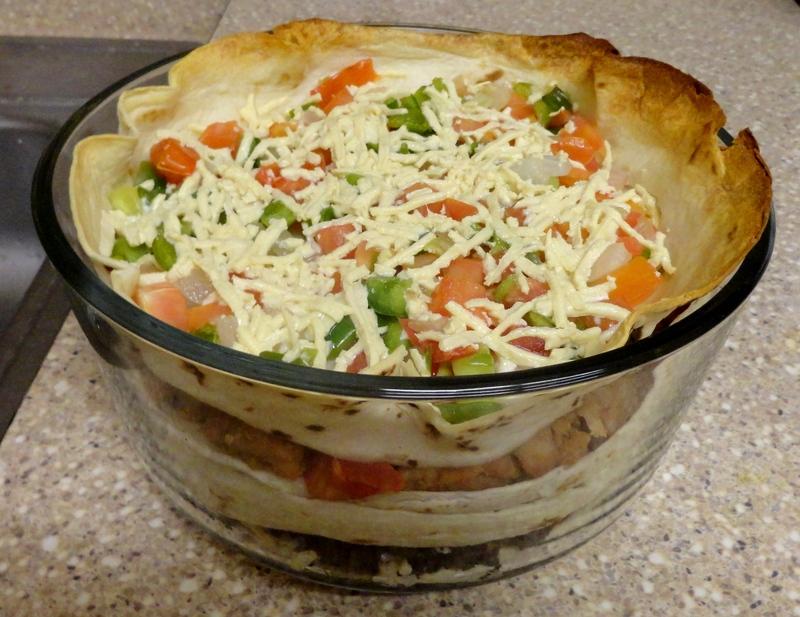 For example, this lovely Mexican “lasagna” I made for myself and Peter the other night. 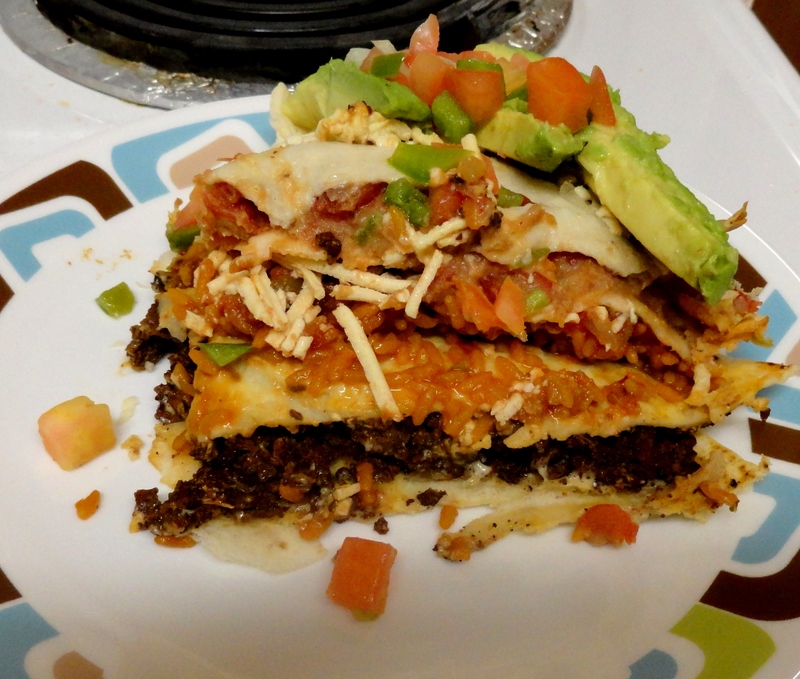 It’s layers of tortillas filled with refried beans, Spanish rice, Rotel, seasoned Tofu Crumbles, and Daiya. Lots and lots of Daiya. I topped it with diced onion, tomato, bell pepper, and more cheez. Then after it finished baking I added sliced avocado and a bit of salsa on top on my slice. Yum. 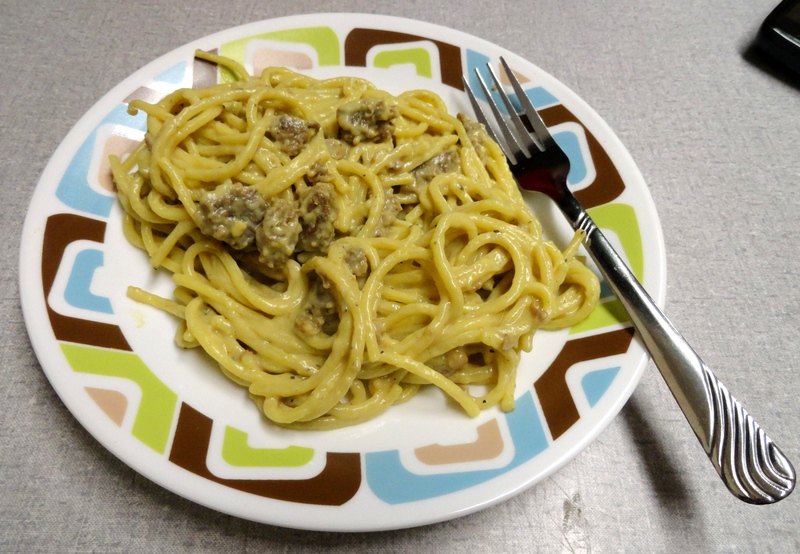 Another delicious meal I threw together this week was “cheezy beef pasta”. Which was just pasta, a quickly made cheez sauce (Earth Balance, flour, plain soymilk, nutritional yeast, and seasoning salt), and a crumbled Gardein burger. Simple, but quite tasty. Food Prep class has also had some good vegan food coming out of its labs. 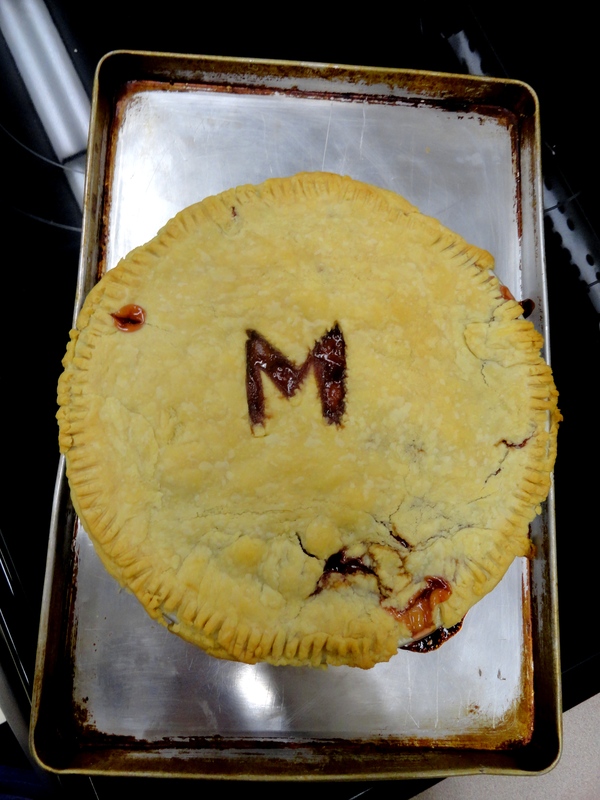 This week was pie lab and we got to make a cherry pie. 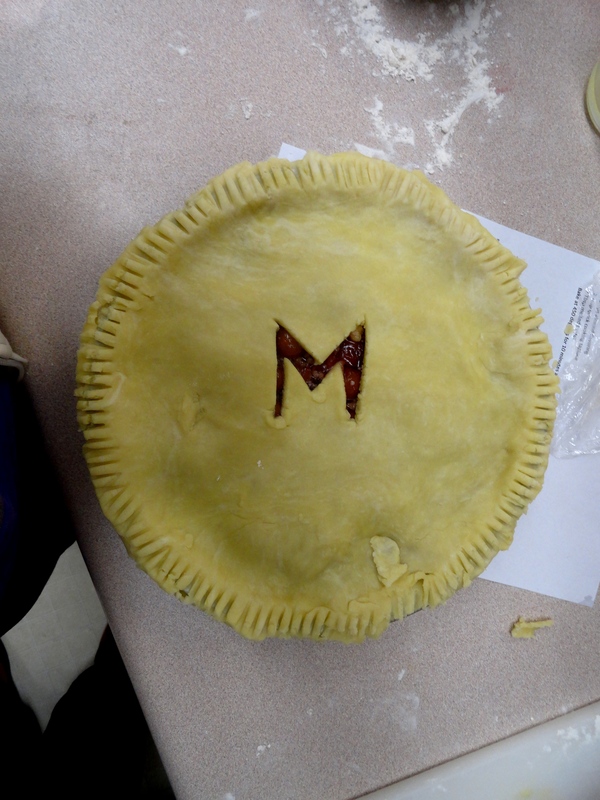 To release steam we had to cut a hole in the crust, so I went the school spirit route and cut a M for Montevallo. It kinda leaked while baking, but still managed to taste great. We also had a pizza lab, where the wonderful Dr. Mathisen got Daiya so we wouldn’t have a wimpy looking cheez-less pizza. Everyone was skeptical about how it would taste (except me, of course) and one girl even so far as to say the melted Daiya looked like “melted Crayola crayons” but everyone was eating their rude remarks when they got a mouthful of the pizza. 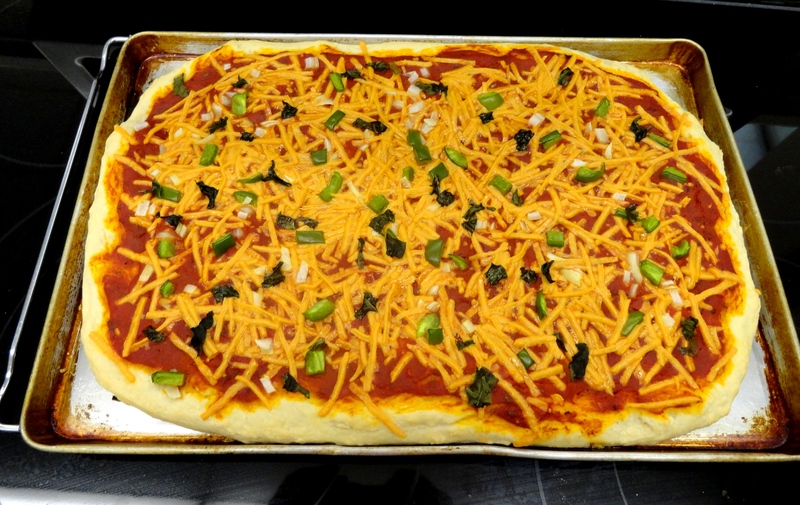 It was delicious with its yeasty crust, homemade marinara sauce, and toppings of onion, bellpepper, and fresh basil.